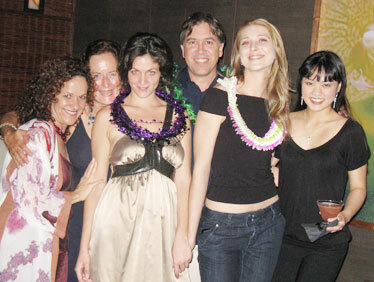 HSF CAST PARTIES AT NOBU WAIKIKI: Hawaii Shakespeare Festival co-founder Tony Pisculli joined cast members Ann Brandman (Nym/Alice), left, Eden-Lee Murray Jellinek (Gower), Eleanor C. Svaton (Katherine), Elizabeth Wolfe (King Henry) and Kathryn Mariko Lee (Cambridge/Bates) as the cast and crew celebrated the opening of "Henry V" on Friday with a late-night party at Nobu Waikiki. Pisculli and his all-female cast got the hookup for the gourmet affair thanks to Svaton, who works at Nobu when she is not playing Katherine of Valois opposite Wolfe's King Henry of England on the HSF stage in Chinatown. "Henry V" cast members Michelle Umipeg (Dauphin), left, and Morgan Alicia Smith (Constable of France) said they enjoy playing the arrogant and overconfident designated villains of the story. Umipeg gave an unforgettable performance last summer under the name Michelle Raboteau, playing Prince Arthur in HSF's "King John." Regarding the name change, she said, "I'm divorced and have decided to use my maiden name." LOKAHI FUNDRAISER LAUNCHED AS LAWN PARTY: Brief sprinkles did not spoil the party as the Lokahi Giving Project presented its inaugural Malama Na Kama'aina fundraiser Saturday at a lawn party on the Lagoon Green at the Hilton Hawaiian Village. 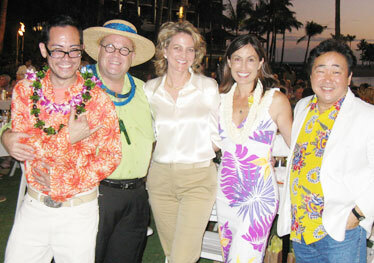 Event chairwoman Trini Kaopuiki Clark, fourth from left, joined silent-auction chairman Lance Rae, left, in thanking Eric Chandler, Dr. Angela Pratt and Takeo for their support shortly before the formal program started. 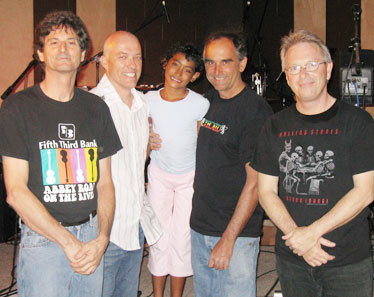 STRANGERS PLAY HIGHER GROUND: Kawehi Schapner, center, helped out as roadie, photographer and sound tech when her dad's band, the Strangers (Ian Chames, left, Robert Brey, Otis Schapner and Michael Scherr), played a three-hour set Sunday at Higher Ground in Wahiawa. The group was excellent, playing a wide range of classic rock, but two highlights were originals -- "Trailer Park Princess" and "Cheap Suit" -- from their current album, "Meet the Strangers." MILO DUO PASSES AUDITION: The Peter Milo Duo -- Eric Lee, left, and Peter Milo -- was on the spot in a two-hour audition set Tuesday at Rum Fire in the Sheraton Waikiki. 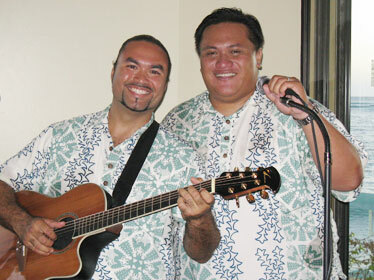 The duo won the job with an unpredictable assortment of Hawaiian standards, pop oldies, obscure local favorites ("Turner's Song") and audience requests ranging from Santana to HAPA. They open at Rum Fire for a Tuesdays-only pau hana gig in September.